When I purchased my Apple Pencil to use with the new iPad Pro 9.7″, I was apprehensive about losing not only the Pencil, but the extra Pencil tip and the small Lightening port adaptor. Apple Inc., doesn’t offer any viable storage solution to keep all of the Apple Pencil and the new iPad Pro accessories in one safe place. 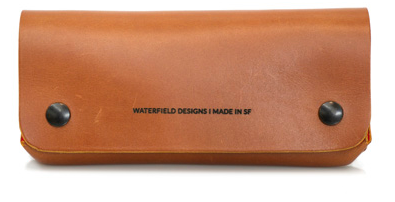 Enter WaterField Designs; a San Francisco company that designs and manufactures stylish cases, sleeves, and bags for tech devices. Their Atelier iPad Gear Case is the perfect answer to keep your iPad Pro 9.7″ and Apple Pencil accessories in one handy place. The Atelier iPad Gear Case is hand-crafted in brown full-grain leather, and this gorgeous leather will develop a rich patina when handled over time. There are two heavy-duty external snaps that firmly close the case. The case measures 7.5″L x 1.25″W x 3″H which is adequate for all the iPad Pro 9.7″ and Apple Pencil accoutrements. The interior of the case is lined with red soft Ultrasuede. 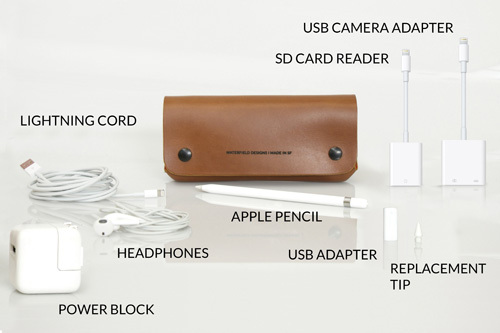 There is a dedicated pocket for the Apple Pencil into which it can easily slide, two compartments that will hold earbuds, an extra Pencil tip, the Lightening adaptor, an Apple USB camera adaptor or an Apple SD card reader, and a large compartment that holds a Lightening cable and a power adaptor. I was impressed that after placing all of these items in the case that the case didn’t appear bulky or unwieldy. 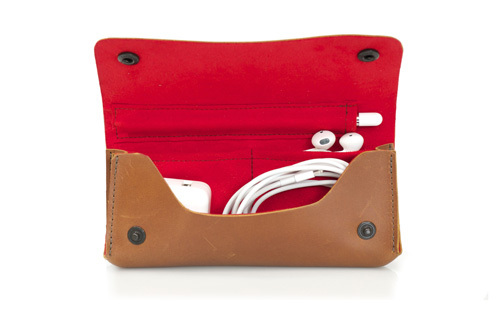 The interior Ultrasuede pockets measures 3.5″L x 2.75″H, and although the Apple USB camera adaptor fits, the cord must bend a bit in order for it be secure in the pocket. I was a bit hesitant about storing my extra Apple tip in the case, fearing it may possibly fall out of the pocket. I placed the tip deep into the pocket and tried very hard to shake it back out without success. The Ultrasuede has enough nap to firmly hold the Apple Pencil tip and Lightening adaptor in place. That was enough to convince me that the Atelier iPad Gear Case is a must-have accessory for Apple Pencil and iPad Pro owners. This case is great for travel and everyday use. Pack up the case and put it in a purse, briefcase, or travel bag and all of your iPad Pro and Apple Pencil items are in one place. It takes up no more room than an eyeglass case. I would be remiss if I didn’t mention the beautiful stitching on the case. The machine stitching is straight and strong; this is a case that is definitely built to last. The only thing I could want from this case is perhaps a clip on the back to clip the Atelier iPad Gear Case over a SmartCover case. The $70 price tag may be a consideration for some consumers, but keeping in mind that the case is hand-crafted from premium leather and Ultrasuede, you truly are getting a high quality item that will last for a very long time. 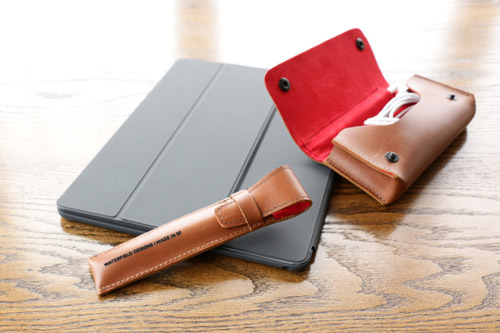 WaterField Designs also sells a companion Apple Pencil case with the same supple leather and Ultrasuede interior for MSRP $29.00, and it does have a clip to fasten the pencil case on the iPad Pro. It is obvious from the quality materials and stitching of the Atelier iPad Gear Case that WaterField Designs takes great pride in their workmanship and tech device designs. The Atelier iPad Gear Case is a fabulous item to hold all of your iPad Pro accessories and it will now accompany my iPad Pro wherever I go.